Moving out of your rental apartment requires cleaning it before you leave it in order to get your deposit back. The entire moving experience can be a bit pricey and to save money, some people choose to clean it by themselves instead of hiring trusted cleaning services in London. This option might seem reasonable at first but if some lease agreements require a professional cleaning before moving out or you do not excel at thorough cleaning, perhaps you need to think about this harder. Before you decide what will work best for you, consider following things first. Can you live up to the challenge? End of tenancy cleaning is not a regular cleaning. There are certain standards that landlords and letting agents require. So, before you start, perhaps you should talk to your landlord and agree on what areas and items have to be cleaned thoroughly. This will save you a lot of time and effort. With all those moving preparations and your moving date approaching while you still have tons of things to take care of, perhaps you won’t have enough time to clean the apartment by yourself. You need to know when it is wise to hire pros for the job. But if you have enough time to tackle the cleaning task, don’t underestimate it because it is not an easy job. 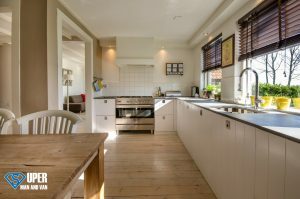 The key to avoiding tenancy deposit disputes are organisation and thoroughness. Also, ask your friends or family members to help you out. They say that cleanliness is an objective thing so perhaps what one person cannot spot, the other one might. Is the DIY option cheaper in reality? A common misconception is that hiring professional cleaning companies is always more expensive than cleaning a rental apartment by yourself. In some instances, hiring pros is the better deal. Before you decide, calculate what DIY cleaning would cost you. If you have to deep-clean carpets, you will have to rent the cleaning machines. Then, you will have to buy detergents, cleaning tools and other supplies. Next step, compare prices of the professional end of tenancy services. If there is no significant difference in the end price, hire pros because it is a safer option to get your deposit back. If you choose this option, make sure you invest in quality cleaners and cleaning equipment. On the other hand, if your landlord requires explicitly professional cleaning, you don’t have enough time or operating rented deep-cleaning machines is unfamiliar to you, then you will have no other option than to hire a professional company that will clean the place and ensure that much-needed deposit.